I have this hope that most of you reading this post aren’t criminals, or terrorists. So this might be interesting to you, if you want to know how they think and carry out their business. 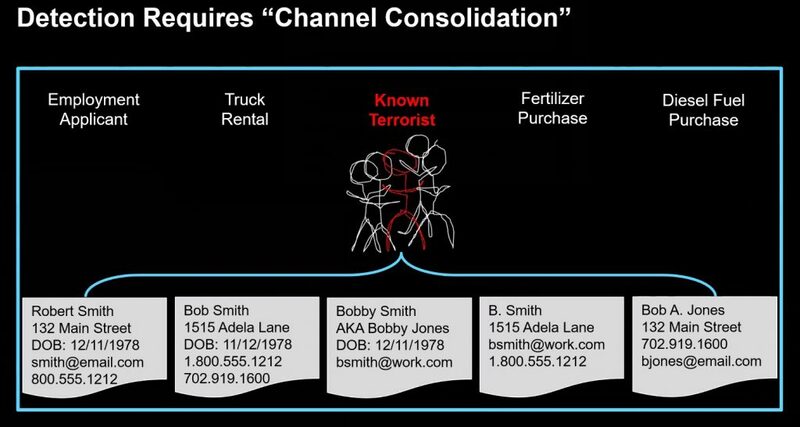 Their number one technique is called channel separation, the ability to use multiple identities to prevent them from being caught. Let’s say you want to rob a bank, or blow something up. You use one identity to rent the getaway car. Another to open an account at the bank. And other identities to hire your thugs or whatnot. You get the idea. But in the process of creating all these identities, you aren’t that clever: you leave some bread crumbs or clues that connect them together, as is shown in the diagram below. This is the idea behind a startup that has just come out of stealth called Senzing. It is the brainchild of Jeff Jonas. The market category for these types of tools is called entity resolution. Jonas told me, “Anytime you can catch criminals is kind of fun. Their primary tradecraft holds true for anyone, from bank robbers up to organized crime groups. No one uses the same name, address, phone when they are on a known list.” But they leave traces that can be correlated together. Jonas started working on this many years ago at IBM. He is trying to disrupt the entity resolution market and eventually spun out Senzing with his tool. The goal is that you have all this data and you want to link it together, eliminate or find duplicates, or near-duplicates. Take our criminal, who is going to rent a truck, buy fuel oil and fertilizer, and so forth. He does so using the sample identities shown at the bottom of the graphic. Senzing’s software can parse all this data and within a matter of a few minutes, figure out who Bob Smith really is. In effect, they merge all the different channels of information into a single, coherent whole, so you can make better decisions. Entity resolution is big business. There are more than 50 firms that sell some kind of service based on this, but they offer more of a custom consulting tool that requires a great deal of care and feeding and specialized knowledge. Many companies end up with million-dollar engagements by the time they are done. Jonas is trying to change all that and make it much cheaper to do it. You can run his software on any Mac or Windows desktop, rather than have to put a lot of firepower behind the complex models that many of these consulting firms use. Who could benefit from his product? Lots of companies. For example, a supply chain risk management vendor can use to scrape data from the web and determine who is making trouble for a global brand. Or environmentalists looking to find frequent corporate polluters. A finservices firm that is trying to find the relationship between employees and suspected insider threats or fraudulent activities. Or child labor lawyers trying to track down frequent miscreants. You get the idea. You know the data is out there in some form, but it isn’t readily or easily parsed. “We had one firm that was investigating Chinese firms that had poor reputations. They got our software and two days later were getting useful results, and a month later could create some actionable reports.” The ideal client? “Someone who has a firm that may be well respected, but no one actually calls” with an engagement, he told me. Jonas started developing his tool when he was working at IBM several years ago. I interviewed him for ReadWrite and found him fascinating. An early version of his software played an important role in figuring out the young card sharks behind the movie 21 were taking advantage of card counting in several Vegas casinos, and was able to match up their winnings all over town and get the team banned. Another example is from Colombia universities who saved $80M after finding 250,000 fake students being enrolled. IBM gets a revenue share from Senzing’s sales, which makes sense. The free downloads are limited in terms of how much data you can parse (10,000 records), and they also sell monthly subscriptions that start at up to $500 for the simplest cases. It will be interesting to see how widely his tool will be used: my guess is that there will be lots of interesting stories to come. 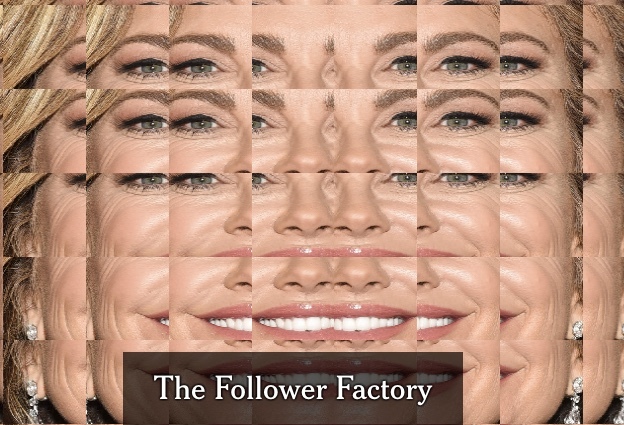 The New York Times last week published the results of a fascinating research project entitled The Follower Factory, that describes how firms charge to add followers, retweets, likes and other social interactions to social media profiles. While we aren’t surprised at the report, it highlights why B2B marketers shouldn’t shortcut the process of understanding the substance of an influencer’s following when making decisions about whom to engage. The Times report identifies numerous celebrities from entertainment, business, politics, sports and other areas who have inflated their follower numbers for as little as one cent per follower. In most cases, the fake followers are empty accounts without any influence or copies of legitimate accounts with subtle tweaks that mask their illegitimacy. The topic isn’t a new one for either of us. Paul wrote a book on the topic more than ten years ago. Real social media influencers get that way through an organic growth in their popularity, because they have something to say and because people respond to them over time. There is no quick fix for providing value. Twitter is a popular subject for analysis because it’s so transparent: Anyone can investigate follower quality and root out fake accounts or bots by clicking on the number of followers in an influencer’s profile. Other academic researchers have begun to use Twitter for their own social science research, and a new book by UCLA professor Zachary Steinert-Threkeld called Twitter as Data is a useful place for marketers who know a little bit of code to assemble their own inquiries. (The online version of the book is presently free from the publisher for a limited time.) David has written more about his book on his blog here. Paul and David review some of their time-tested techniques to growing your social media following organically, and note the ongoing value of blogs as a tool for legitimate influencers to build their followings. A new book by UCLA professor Zachary Steinert-Threkeld called Twitter as Data is available online free for a limited time, and I recommend you download a copy now. While written mainly for academic social scientists and other researchers, it has a great utility in other situations. Zachary has been working with analyzing Twitter data streams for several years, and basically taught himself how to program enough code in Python and R to be dangerous. The book assumes a novice programmer, and provides the code samples you need to get started with your own analysis. Why Twitter? Mainly because it is so transparent. Anyone can figure out who follows whom, and easily drill down to immediately see who are these followers, and how often they actually use Twitter themselves. Most Twitter users by default have open accounts, and want people to engage them in public. Contrast that with Facebook, where the situation is the exact opposite and thus much harder to access. To make matters easier, Twitter data comes packaged in three different APIs, streaming, search and REST. The streaming API provides data in near-real-time and is the best way to get data on what is currently trending in different parts of the world. The downside is that you could be picking a particularly dull moment in time when nothing much is happening. The streaming API is limited to just one percent of all tweets: you can filter and focus on a particular collection, such as all tweets from one country, but still you only get one percent.That works out to about five million tweets daily. Many researchers run multiple queries so they can collect more data, and several have published interesting data sets that are available to the public. And there is this map that shows patterns of communication across the globe over an entire day. The REST API has limits on how often you can collect and how far back in time you can go, but isn’t limited to the real-time feed. Interesting things happen when you go deep into the data. Zachary first started with his Twitter analysis, he found for example a large body of basketball-related tweets from Cameroon, and upon further analysis linked them to a popular basketball player (Joel Embiid) who was from that country and lot of hometown fans across the ocean. He also found lots of tweets from the Philippines in Tagalog were being miscataloged as an unknown language. When countries censor Twitter, that shows up in the real-time feed too. Now that he is an experienced Twitter researcher, he focuses his study on smaller Twitterati: studying the celebrities or those with massive Twitter audiences isn’t really very useful. The smaller collections are more focused and easier to spot trends. So take a look at Zachary’s book and see what insights you can gain into your particular markets and customers. It won’t cost you much money and could payoff in terms of valuable information. One of my favorite NY Times technology stories (other than, ahem, my own articles) is one that ran more than ten years ago. It was about a supposedly anonymous AOL user that was picked from a huge database of search queries by researchers. They were able to correlate her searches and tracked down Thelma, a 62-year old widow living in Georgia. The database was originally posted online by AOL as an academic research tool, but after the Times story broke it was removed. The data “underscore how much people unintentionally reveal about themselves when they use search engines,” said the Times story. In the intervening years since that story, tracking technology has gotten better and Internet privacy has all but effectively disappeared. At the DEFCON trade show a few weeks ago in Vegas, researchers presented a paper on how easy it can be to track down folks based on their digital breadcrumbs. The researchers set up a phony marketing consulting firm and requested anonymous clickstream data to analyze. They were able to actually tie real users to the data through a series of well-known tricks, described in this report in Naked Security. They found that if they could correlate personal information across ten different domains, they could figure out who was the common user visiting those sites, as shown in this diagram published in the article. The culprits are browser plug-ins and embedded scripts on web pages, which I have written about before here. “Five percent of the data in the clickstream they purchased was generated up by just ten different popular web plugins,” according to the DEFCON researchers. So is this just some artifact of gung-ho security researchers, or does this have any real-world implications? Sadly, it is very much a reality. 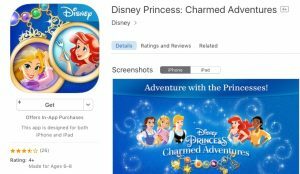 Last week Disney was served legal papers about secretly collecting kid’s usage data of their mobile apps, saying that the apps (which don’t ask parents permission for the kids to use, which is illegal) can track the kids across multiple games. All in the interest of serving up targeted ads. The full list of 43 apps that have this tracking data can be found here, including the one shown at right. So what can you do? First, review your plug-ins, delete the ones that you really don’t need. In my article linked above, I try out Privacy Badger and have continued to use it. It can be entertaining or terrifying, depending on your POV. You could regularly delete your cookies and always run private browsing sessions, although you do give up some usability for doing so. Privacy just isn’t what it used to be. And it is a lot of hard work to become more private these days, for sure. Several years ago I wrote, “everyone is in the software business. All of the interesting business operations are happening inside your company’s software.” Since then, this trend has intensified. Today I want to share with you three companies that should come under the software label. And while you may not think of these three as software vendors, all three run themselves like a typical software company. The three are Tesla, Express Scripts, and the Washington Post. It is just mere happenstance that they also make cars, manage prescription benefits and publish a newspaper. Software lies at the heart of each company, as much as a Google or a Microsoft. Continuous updates. One of the distinguishing features of the Tesla car line is that they update themselves while they are parked in your garage. Most car companies can’t update their fleet as easily, or even ever. You have to bring them in for servicing, to make any changes to how they operate. Tesla’s dashboard is mostly contained inside a beautiful and huge touch LED screen: the days of dedicated dials are so over. These continuous updates are also the case for The Washington Post website, so they can stay competitive and current. The Post posts more total articles than the NYTimes with double the reporting staff of the DC-based paper. That shows how seriously they take their digital mission too. These companies are driven by web analytics and traffic and engagement metrics. Just like Google or some other SaaS-based vendor, The Washington Post post-Bezos is obsessed with stats. Which articles are being read more? Can they get quicker load times, especially on mobile devices? Will readers pay more for this better performance? The Post will try out different news pegs for each piece to see how it performs, just like a SaaS vendor does A/B testing of its pages. Digital products are the drivers of innovation. “There are no sacred cows [here, we] push experimentation,” said one of the Post digital editors. “It is basically, how fast do you move? Innovation thrives in companies where design is respected.” The same is true for Express Scripts. “We have over 10 petabytes of useful data from which we can gain insights and for which we can develop solutions,” said their former CIO in an article from several years ago. Scaling up the operations is key. Tesla is making a very small number of cars at present. They are designing their factories to scale up, to where they can move into a bigger market. Like a typical SaaS vendor, they want to build in scale from the beginning. They built their own ERP system that shortens the feedback loop from customers to engineers and manages their entire operations, so they can make quick changes when something isn’t working. You don’t think of car companies being so nimble. The same is true for Express Scripts. They are in the business of managing your prescriptions, and understanding how people get their meds has become more of a big data problem. They can quickly figure out if a patient is following their prescription and predict the potential pill waste if they aren’t. The company has developed a collection of products that tie in an online customer portal to their call center and mobile apps. I am sure you can come up with other companies that make normal stuff like cars and newspapers that you can apply some of these metrics to. The lessons learned from the software industry are slowly seeping into other businesses, particularly those businesses that want to fail fast and more quickly as their markets and customers change. A recent Simility blog post detailed how it is tracking online fraud. With the help of a SaaS-based machine learning tool, the company and its beta customers have seen a 50 to 300 percent reduction in fraudulent online transactions. This last January, they looked at 100 different behaviors across 500,000 endpoints scattered around the world. They found more than 10,000 of those devices were compromised, and then looked for patterns of similar behavior. They found seven commonalities, and some of them are surprising. You can read my blog post on IBM’s SecurityIntelligence.com here. IBM SecurityIntelligence blog: Can You Still Protect Your Most Sensitive Data? An article in The Washington Post called “A Shift Away From Big Data” chronicled several corporations that are actually deleting their most sensitive data files rather than saving them. This is counterintuitive to today’s collect-it-all data-heavy landscape. However, enterprises are looking to own their encryption keys and protecting their metadata privacy. Plus, there is a growing concern that American-based companies are more vulnerable to government requests than offshore businesses. You can read more on IBM’s SecurityIntelligence.com blog here. I return to doing a regular series of podcasts with my long-time former partner Paul Gillin, called For Immediate Release: B2B. Paul and I co-hosted almost 100 episodes of MediaBlather back several years ago, and many of those shows have held up well talking about how technical PR and marketing communications professionals can leverage new media and other strategies. In this week’s show, we talk about the upcoming merger between Microsoft and LinkedIn (Paul and I are split on whether it is a good thing), and interview Radius.com CEO Darian Shirazi about predictive analytics and its utility for marketing and customer retention.